The conquest of the Philippines completed the principal mission of the Commander in Chief of the Southwest Pacific Area. Effective at once U.S. Army Forces in the Pacific is established. Short title AFPAC. U.S. Army Forces in the Pacific will consist of those forces presently assigned U.S. Army Forces in POA. General of the Army MacArthur is designated Commander-in-Chief, U.S. Army Forces in the Pacific (CINCAFPAC), in addition to his present assignment. Transfer of forces will be accomplished in accordance with instructions issued by JCS already. On the same day General MacArthur issued General Order Number 1, GHQ, AFPAC, which established AFPAC and placed it under his command. Four months later the Japanese surrendered. At Potsdam in July of 1945, the heads of the governments of the United States and the United Kingdom agreed upon the terms of the surrender ultimatum to be offered Japan. Following this agreement, the Potsdam Declaration, concurred in by China and subsequently approved by the Union of Soviet Socialist Republics, was issued on 26 July. The Japanese capitulation proclamation included acceptance of the terms of this declaration. From the moment of surrender, the authority of the Emperor and the Japanese Government to rule the state will be subject to you and you will take such steps as you deem proper to effectuate the surrender terms. You will exercise supreme command over all land, sea and air forces which may be allocated for enforcement in Japan of the surrender terms by the Allied Forces concerned. SCAP was granted authority to establish direct military government if necessary;6 he was, however, to exercise his power, as far as compatible with the accomplishment of his mission, through the Emperor of Japan and the Japanese Government.7 This authority determined the administrative character of the Occupation. Direct military government, similar to the type operating in Germany, was not established in Japan. The Japanese Government was permitted to exercise normal powers in matters of domestic administration; certain changes in governmental machinery and personnel were made to insure that requirements of the Occupation were met. an advisory body. It was located in Tokyo and consisted of four members: the Supreme Commander (or his Deputy), who was Chairman and United States Representative; a representative each from the Soviet Union and China; and a member representing jointly the United Kingdom, Australia, New Zealand, and India.10 The Council met every two weeks "to consult with and advise" the Supreme Commander on the implementation of the terms of surrender, the occupation and control of Japan, and any supplementary directives; it exercised certain limited authority. The Supreme Commander carried out the terms of the basic directive and supplementary interim directives of the U. S. Joint Chiefs of Staff. 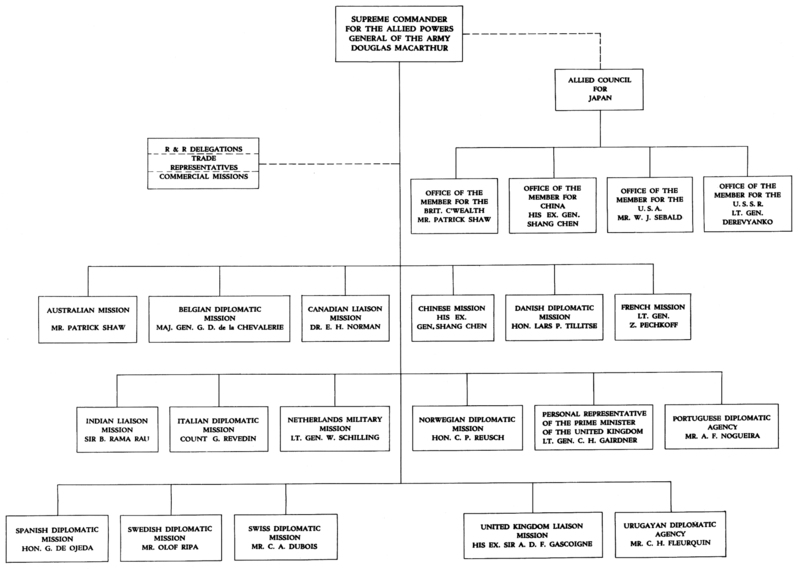 Policies adopted by the Far Eastern Commission were transmitted to him through the Joint Chiefs of Staff. SCAP issued the necessary orders and directives to the Japanese Government and to the Occupation forces, and insured that these orders were put into effect. Despite the fact that he was directly responsible to the U. S. Joint Chiefs of Staff, he consulted and advised the Allied Council for Japan on matters of substance in the execution of policy decisions of the Far Eastern Commission. 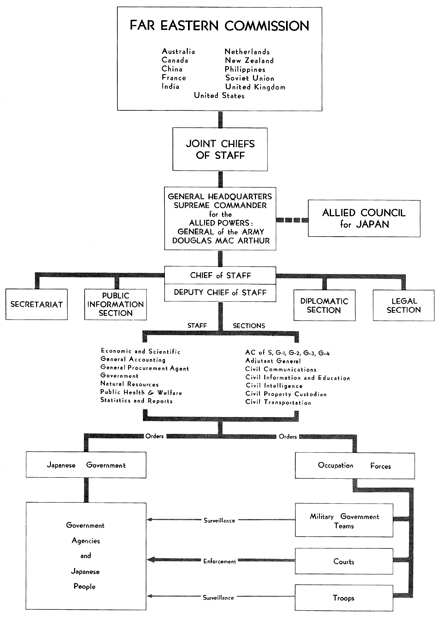 After the appointment of General MacArthur as Supreme Commander,12 a General Headquarters for SCAP was established with origins in the then existing GHQ, AFPAC (U. S. Army Forces in the Pacific); GHQ, AFPAC, and GHQ, SCAP, were physically combined and, for practical reasons, a number of staff sections, agencies and individuals continued to perform dual roles for SCAP and AFPAC. There was, however, a distinct demarcation between the authority and responsibility of SCAP and CINCAFPAC. SCAP's authority was limited to Japan, whereas CINCAFPAC commanded all Army Forces in the Pacific area. The Supreme Commander exercised authority over all land, sea, and air forces which were then assigned to Japan. These forces included the British Commonwealth Occupation Force (BCOF)-the only representative Allied force present-the U.S. naval forces, and U. S. air forces. 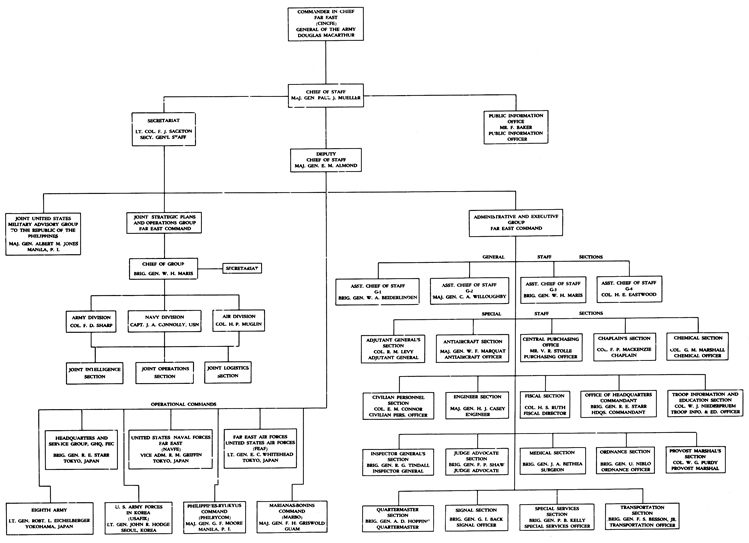 The Eighth U. S. Army was the actual Army of Occupation13 and was charged with the tactical mission of implementing and enforcing SCAP directives. through SCAP to the Japanese People, December 1948. There were other equally important enforcement and surveillance agencies operating on a national scale from the outset of the Occupation: Counter Intelligence, Censorship, Public Safety, the Military Police and local Provost Marshal. 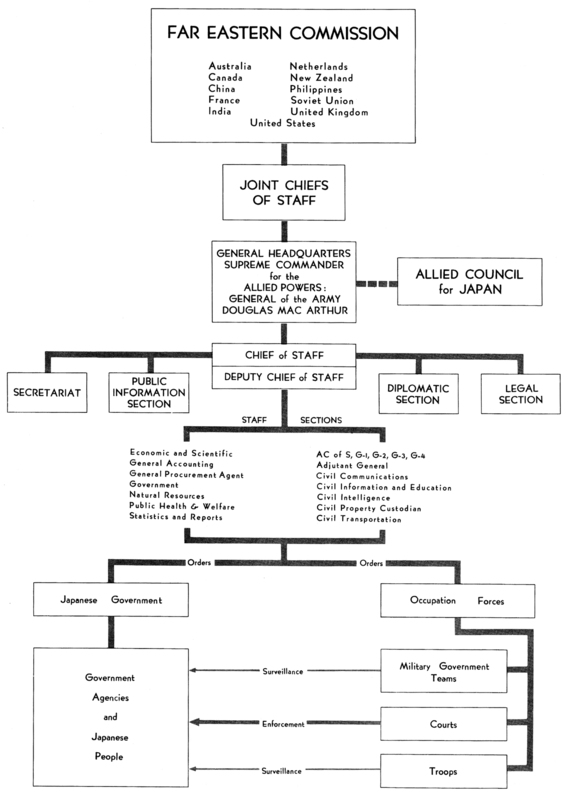 General Headquarters, SCAP, functioned along the lines of a conventional military staff, but since SCAP was charged with the primary mission of steering the Japanese nation and people along the lines of SCAP directives, its staff structure was designed to meet requirements of Japanese civil affairs in all phases of human activity. The Supreme Commander exercised command of naval forces allocated to the Occupation through COMNAVJAP. Actually the headquarters of COMNAVFE (Commander, U. S. Naval Forces, Far East) and COMNAVJAP were physically combined. COMNAVJAP controlled the coastal waters of Japan, commanded all naval activities ashore in the Occupation area, and exercised operational control of all naval forces, both U. S. and Allied, assigned to the Occupation of Japan.25 COMNAVJAP also controlled activities of Japanese shipping through SCAJAP (Shipping Control Authority for the Japanese Merchant Marine).26 SCAJAP played an important role in the general repatriation movements. As naval representative of SCAP,27 COMNAVJAP was responsible for the disposal and scrapping of the Japanese Navy;28 repatriation of Japanese and other foreign nationals;29 mine-sweeping in Japanese waters;30 the supervision of the Japanese Merchant Marine;31 and declaration and disposal of surplus naval property. Progressive steps were taken to enforce SCAP's orders. First, the Japanese Government was held responsible for its actions and for the enforcement of laws, ordinances, and regulations which were promulgated to carry out the instructions of SCAR Secondly, juridical enforcement was effected by the military occupation courts. They had sole jurisdiction with Japanese courts over any act prejudicial to the objectives of the Occupation.34 Ultimate enforcement rested with the Occupation troops. (1) SCAP will issue all necessary instructions directly to the Japanese Government. (2) Every opportunity will be given the Government and people of Japan to carry out such instructions without further compulsion. (3) The Occupation Forces will act principally as an agency upon which SCAP can call, if necessary, to secure compliance with instructions issued to the Japanese Government and will observe and report on compliance. ... in view of the present character of Japanese society and the desire of the United States to attain its objectives with a minimum commitment of its forces and resources, the Supreme Commander will exercise authority through Japanese Governmental machinery and agencies, including the Emperor, to the extent that this satisfactorily further United States objectives. (1) So long as the system of enforcing the Potsdam Declaration and the surrender terms through the Japanese Government worked satisfactorily, there would be no direct military government in Japan. (2) A number of special staff sections would be established by General Headquarters, SCAP, to advise the Supreme Commander on non-military matters in relation to the occupation of Japan. (3) The Military Government Section, General Headquarters, USAFPAC would be discontinued and its remaining personnel transferred to the several new staff sections or to the military government of Korea. The Civil Intelligence Section was discontinued on 3 May 1946 and its duties assumed by the Assistant Chief of Staff, G-2.47 On 29 August it was reactivated48 but continued under operational control of G-2 in his dual capacity as Chief of Theater Counter Intelligence. The SCAP Sections (Plate No. 26) corresponded in general to the technical branches of the Japanese civil government with which they were associated.49 They were responsible for making recommendations to the Supreme Commander on policies and actions which would implement the terms of the surrender and the directives received from higher authorities. They carried on continuous research and analysis and maintained close liaison with their counterparts in the Japanese Government.50 They operated directly under a Deputy Chief of Staff who was assisted by an Executive for Administrative Affairs and an Executive for Economic and Industrial Affairs. The Diplomatic Section, an outgrowth of the Office of the United States Political Advisor for Japan, was an integral section of GHQ, SCAP.56 It dealt with international affairs pertaining to Japan. The Section controlled relationships with foreign diplomatic representatives and supervised other U. S. State Department agencies in Japan.57 As chairman and member for the United States on the Allied Council for Japan, the chief of the Diplomatic Section was also deputy for the Supreme Commander. 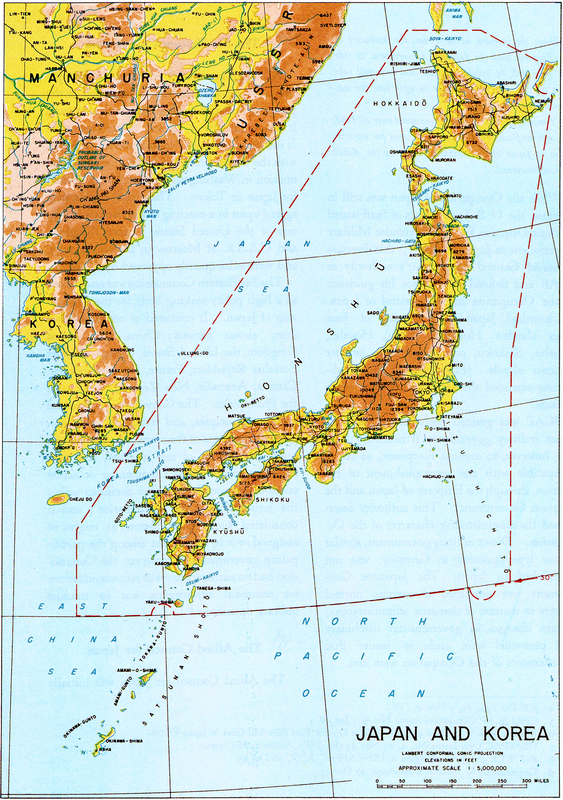 SCAP's mission in the economic field in Japan was an integral part of the total Occupation objective, namely, to insure that Japan would not again, alone or jointly with other powers, commit aggressive warfare. In an attempt to carry out this mission, three major lines of action were followed in the economic field: the industrial and scientific disarmament of Japan, the democratization and reform of the economic structure, and the restoration of the Japanese general economy on a self-supporting basis. Since Japan could feed herself only by exporting manufactured products, her economy was closely geared to foreign trade. American aid was limited to the most urgent requirements necessary to avoid disease and unrest in the harassed population. American appropriation made possible the importation of food, fertilizer, petroleum products, and medicines. With the exception of cotton, Japan had no funds to import raw materials. In March 1947 ESS was granted the power to issue licenses to approved foreign concerns desiring to conduct business in Japan. Such licenses incorporated restrictions which were necessary to assure compliance with all existing regulations.61 On 15 August 1947, private foreign trade representatives were permitted to enter Japan. The Natural Resources Section. Although Japan claimed that the basic reason for her aggression in the Far East was economic, the chief cause being the desperate need for raw materials, the ironic result was further depletion of her meager resources. To establish favorable economic conditions, which would help prevent the revival of militarism, it was necessary to increase Japan's resources to satisfy her needs and to democratize her institutions. The Natural Resources Section was established as a special staff section to advise SCAP on agricultural, forestry, fishery, and mining (including geology and hydrology) policies and activities in Japan.63 It arranged for and co-ordinated surveys and reports; located source data in Japan relating to agriculture, forestry, fishing and mining in countries formerly occupied by Japan; and recommended measures to insure the development, exploitation, production, processing, and distribution of basic industry products required for rehabilitation of the national economy. The Government Section was responsible for policies pertaining to the internal structure of civil government in Japan.65 It investigated and reported to the Supreme Commander any modifications and reforms of civil government in Japan. It made recommendations regarding the demilitarization and decentralization of the Japanese Government as well as elimination of feudal and totalitarian practices. It investigated, reported, and made recommendations regarding laws, policies, practices, procedures, and other factors in the personnel administration of the Japanese Government, in order to develop democratic precepts, integrity, and efficiency in its administration. The Civil Communications Section's functions were to rehabilitate and operate civil signal and postal communications in Japan.66 It arranged for and coordinated surveys and reports on existing teleradio and postal communications systems and on laboratories and educational institutions which were adapted to the study of problems relating to signal communications facilities and conditions. The primary consideration in public health and welfare activities was to achieve a level of health and welfare among the civil population which would prevent widespread disease and unrest likely to interfere with the Occupation. The major problem in attempting to achieve this goal was the lack of trained and qualified Japanese personnel to conduct the various programs at national, prefectural, and local levels. Also, there were not enough personnel among military government teams to supervise SCAP-directed national programs. A complete public health organization, from the Ministry of Welfare down to and including the health center level, was established throughout Japan. This called for many educational and training programs to instruct Japanese officials in modern public health and welfare practices. The improvement of public health and the development of welfare activities was an integral part of the program designed to help develop civic responsibilities. archival repositories, religious buildings, and historical monuments. The Civil Transportation Section's duties consisted of making plans for the use and rehabilitation of water and land civil transportation facilities of Japan, except for operating responsibilities assigned to Commander, Naval Activities, Japan.70 The Civil Transportation Section, in conjunction with the Economic and Scientific Section, established requirements and priorities in raw materials and industrial capacity necessary to provide the facilities and equipment for the transportation system in order to serve the essential needs of the internal economy of Japan. The Office of the Civil Property Custodian advised on general policies and controlled and disposed of enemy and Allied properties and assets under its jurisdiction.74 This office recommended and established procedures, and executed approved programs for the blocking and impounding of property which was acquired by Japan under duress, wrongful acts of confiscation, dispossession or spoilation. Lastly, it was responsible for the maintenance of complete records and accounts of all confiscated property and its disposal. The Reparations Technical Advisory Committee was established as a consultative committee to assist the Supreme Commander in the development of technical and administrative procedures to assure an orderly removal of reparations goods from Japan and in settling problems between countries arising over claims.76 The Chairman of the Committee was the Chief of the Reparations Section. The other members of the Committee were chiefs of the Reparations and Restitutions Delegations which represented the Far Eastern Commission. the Far Eastern Commission who desired to participate. The Civil Property Custodian was Chairman of the Committee. On 1 January 1947 a GHQ, FEC, order established the Far East Command, with General MacArthur as Commander in Chief.79 This command was established as an interim measure for the immediate post-war period, with particular consideration to the tactical requirements for protracted occupation of former enemy areas. It was, in fact, an adaptation of the then existing AFPAC organization, with no change in the GHQ staff. It was simply the old staff continuing under a new name, with many of its officers remaining in the same relative positions. The Far East Command included the United States forces in Japan, Korea, the Ryukyus, the Philippines, the Marianas and the Bonins.80 General MacArthur exercised unified command over all forces allocated to him by the Joint Chiefs of Staff and Allied Powers ; however, it was at this time that the Army Forces in the Middle Pacific (AFMIDPAC) passed from his control. The Joint Strategic Plans and Operations Group became an important staff element in the exercise of unified command. It consisted basically of three small, co-equal Ground, Navy and Air Staff Groups which furnished planning teams for joint intelligence, joint operations and joint logistic planning. The Group was small, and its functions were limited to the preparation of joint plans for possible major emergencies. 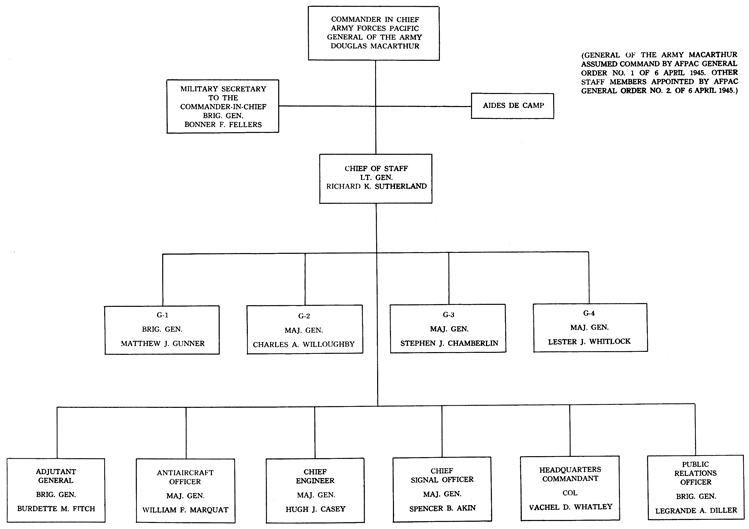 The bulk of General Headquarters was located in the Administrative and Executive Group, which consisted of a conventional high-level General Staff and a Special Staff. This Group handled the major part of CINCFE's military operational functions, including those administrative aspects of joint command pertaining to the peacetime missions of the three services. It should be mentioned again that the nature and duties of the General and Special Staff Sections did not change with the order creating the Far East Command. The change was merely in nomenclature-for example, G-3, GHQ, AFPAC became G-3, GHQ, FEC. By far the largest number of United States Ground Forces allocated to CINCFE were assigned to the Eighth Army, the major command charged with the tactical mission of occupying Japan. United States forces under the Eighth Army were divided into two corps-the IX Corps and the I Corps, each consisting of two divisions. The British Commonwealth Occupation Force came under General MacArthur's operational control in his capacity as Supreme Commander and was assigned to Eighth Army. The XXIV Corps, consisting of two United States divisions, occupied Korea and was designated as U. S. Army Forces in Korea (USAFIK). Generally speaking, the Far East Command was divided into an "Occupation Area" and a "Support Area," with major ground combat elements located in the Occupation Area. 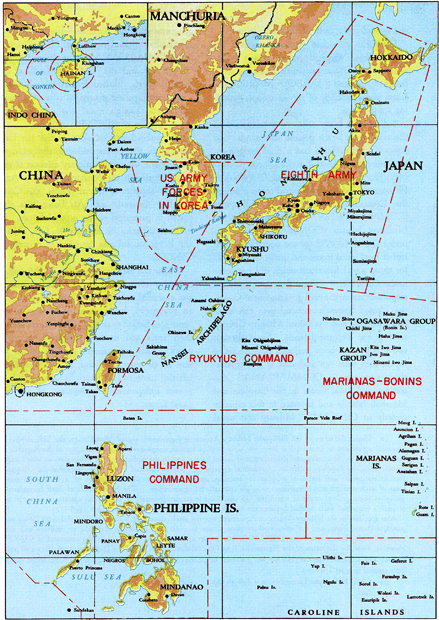 The remaining ground troops, primarily service troops and Philippine Scouts, were distributed among the major ground headquarters in the Support Area, and the Ryukyus, Philippines and Marianas-Bonins Commands. All of these, like Eighth Army and XXIV Corps, were army components. There was no over-all headquarters for the ground elements within the Far East Command, and the four separate ground commands reported directly to CINCFE. 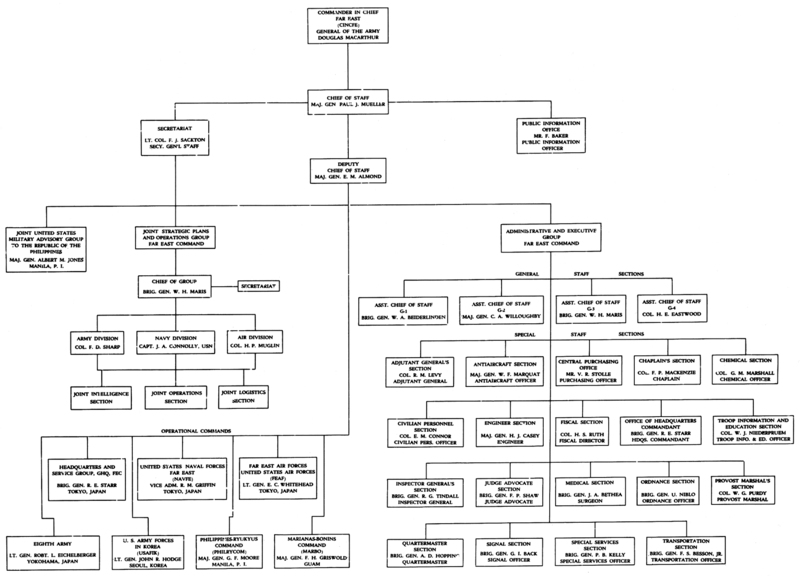 Because of their greater mobility, command of naval and air forces within the theater followed a somewhat different pattern, making it mandatory that control for each of these services be centralized in a single commander. The Commander, Naval Forces, Far East, (COMNAVFE) controlled all naval forces assigned to CINCFE and exercised his authority through appropriate subordinate naval headquarters.88 The Commanding General, Far East Air Forces, (CG, FEAF) was responsible for all air forces assigned to the Far East Command,89 including operational control of the British air contingent in Japan. He exercised his power through three Air Force headquarters and Headquarters, 1st Air Division. Within the over-all air and naval commands, the subordinate structure conformed to the geographical areas where the naval and air bases were located. CINCFE also had jurisdiction over all United States Ground Forces in the Marianas-Bonins Area, known as the Marianas- Bonins Command (MARBO).93 MARBO consisted almost entirely of service troops, including some scouts. Subordinate Navy echelons were located in the same areas as the ground commands. In Japan, COMNAVFE had a dual assignment as Commander, Naval Activities, Japan (COMNAVJAP). In the Philippines, COMNAVFE commanded the local naval forces through the Commander, Naval Forces, Philippines (COMNAVPHIL).94 The Commander of the Marianas Islands (COMMARIANAS) was under COMNAVFE for the operational control of local naval forces and under CINCPAC for those naval functions which did not come under CINCFE.95 These functions included responsibility for the civil government of Guam, the United States trusteeship over the mandated islands, and the Naval Military Government in the Volcano Islands. Since the last two groups had been previous possessions of Japan, they were not included in the trusteeship agreement. COMMARIANAS also commanded naval forces in the Caroline and Marshall Islands and reported in this capacity directly to CINCPAC. Military and naval government in the Marianas-Bonins area was specifically excluded from CINCFE's mission,96 and COMMARIANAS came directly under CINCPAC and the U.S. Pacific Fleet for these functions. United States trusteeship over the former Japanese mandated islands was administered through naval channels and was not a function of CINCFE. The subordinate echelons of the Far East Air Forces also corresponded to the principal land areas. Since the primary mission of the ground forces in the Marianas-Bonins Area was the support of the air forces, the Commanding General, 10th Air Force, was also placed in command of the ground forces. In his first capacity he reported to CG, FEAF, and in his second role, he reported directly to CINCFE. 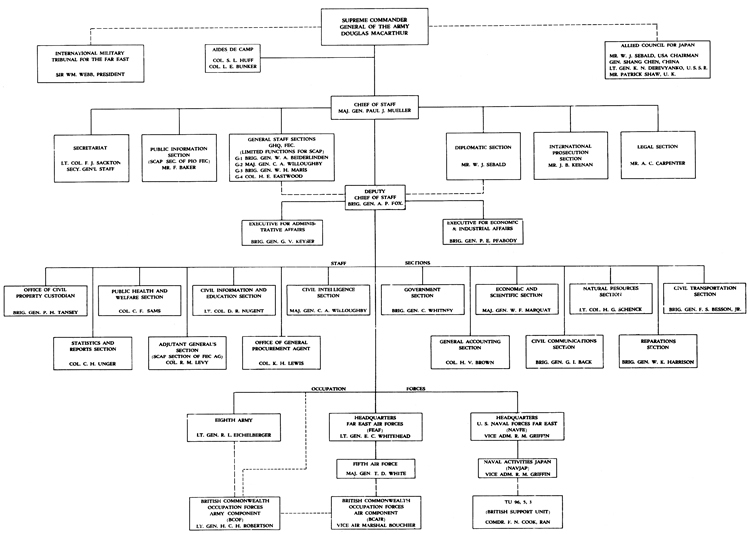 Under the established structure, the unified command of air, ground, and naval elements was exercised only by CINCFE. However, in an emergency, local commanders were to assume jurisdiction over all Far East forces within their areas and execute previously prepared plans. This arrangement insured unified action in an emergency and, at the same time, left the command structure flexible enough to permit independent employment of air and naval forces.